As one meeting of world leaders wraps up in Canada, another will kick off in China. The first meeting — the G7 summit in Quebec — includes most of the world's biggest economies, and they're likely to clash over trade, worry about oil prices and debate the risk of an emerging market slump. But the attendees at the second are likely to have a bigger influence over the future of global growth. The two-day summit of the Shanghai Cooperation Organization (SCO) in Qingdao, which starts on Saturday, will feature the leaders of the world's two fastest growing major economies, India and China. India will attend as a full member of the organization for the first time. Initially established as a regional security grouping, conversations among the SCO nations — China, Russia, India, Pakistan and four Central Asian countries — have increasingly focused on trade. China and India are expected to be the driving force of the global economy in the years to come, along with southeast Asian countries such as Singapore and Malaysia. 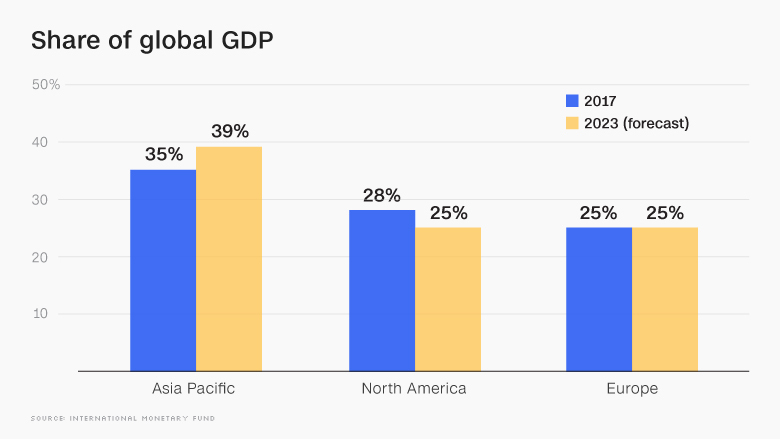 "The Asia Pacific region has become increasingly important as an economic powerhouse for global growth," Rajiv Biswas, chief economist for the region at IHS Markit, told CNNMoney. China alone is expected to contribute around 30% of the total increase in global GDP over the next decade, with India accounting for another 10%, he said. Asia Pacific's share of the global economy is expected to rise to 39% by 2023, while that of North America falls to 25%, according to the International Monetary Fund. With a combined population of over 2.6 billion and a rapidly growing middle class, China and India offer enormous potential. Walmart (WMT) recently paid $16 billion for India's leading online retailer in a bid to secure future growth, while leading US investors took part in Friday's fundraising by a Chinese online payments provider that valued it at more than Wall Street titan Goldman Sachs (GS). Russian President Vladimir Putin will also attend the summit in Qingdao. While the Russian economy is much smaller, and growing slowly, the country remains one of the world's biggest energy producers with powerful influence over oil and gas markets. Xi and Modi: Defenders of free trade? 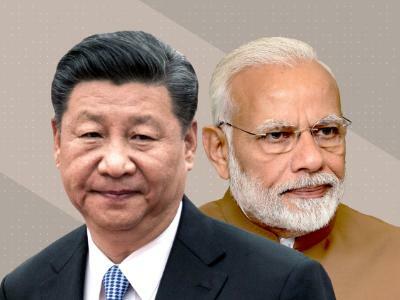 Chinese President Xi Jinping and Indian Prime Minister Narendra Modi have stepped up to defend globalization in recent months, as the United States appears to turn inward under President Donald Trump. Both countries put their names to a statement issued earlier this week that criticized the "new wave of protectionism" and advocated for an "open and inclusive world economy." China and India alone will account for 40% of global economic growth over the next decade. Xi and Modi are set to meet on the sidelines of the Qingdao summit, for the second time in as many months. Modi hailed their sometimes fractious bilateral relationship in a speech last week, saying "Asia and the world will have a better future when India and China work together." Modi is also expected to meet Putin, who he visited last month. "The China-India and India-Russia bilateral meetings on the sidelines will be important," said Dhruva Jaishankar, a foreign policy fellow at Brookings India. But several concerns remain, he added, including India's large and growing trade deficit with China and relatively weak commercial links with Russia. The economic powers at the Chinese summit may not be the closest partners, but the G7 summit has been plagued by its own problems. 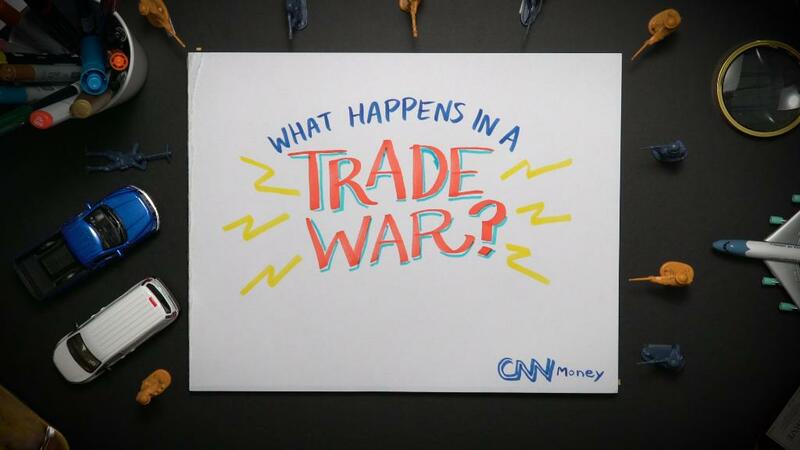 The lead up to the summit has been marked by President Donald Trump's Twitter feud with his counterparts in France and Canada, traditional allies that he's targeted with trade tariffs. French President Emmanuel Macron tweeted that the other G7 members wouldn't "mind signing a 6 country agreement if need be." Trump responded by slamming Canada and the European Union over "massive Trade Tariffs and non-monetary Trade Barriers against the U.S."
Trump will leave the summit early to fly to Singapore for his planned meeting with North Korea's Kim Jong Un. Trump had previously raised the possibility of skipping the Quebec summit altogether, a person familiar with the matter told CNN. Many of the G7 economies, despite their size, are contributing less and less to global growth. The United States is growing at 2.3%, while the European Union economy -- which includes four of the G7 -- grew by 2.5% last year. Japan, another G7 member, grew about 1.6% in 2017 and is expected to slow this year. India and China, meanwhile, are growing at 7.7% and 6.8% respectively. "The rising importance of developing countries in world GDP, led by large emerging markets such as China and India, is increasing their geopolitical weight," said Biswas of IHS Markit. "The SCO summit offers a further platform to build bilateral cooperation as well as strengthening wider cooperation among developing countries."